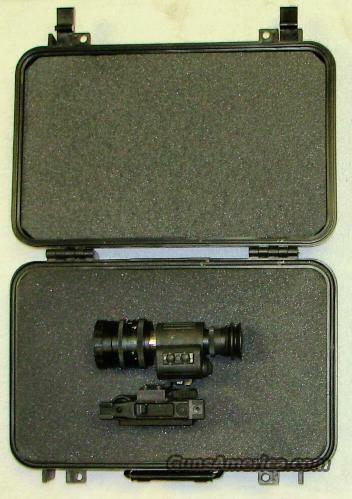 Description: LITTON NIGHT VISION (Northrop Grumman Electro-Optical Systems) - WEAPONS MOUNTABLE NIGHT VISION UNIT. MADE BY LITTON NIGHT VISION (Northrop Grumman Electro-Optical Systems) NIGHT VISION EQUIP. CO. INC. /AMERICAN EAGLE. THIS IS ONE OF THE MAIN US GOVERNMENT CONTRACTORS FOR WEAPONS MOUNTABLE NIGHT VISION. THIRD GENERATION STAR LIGHT, MODEL NVEC-602, 75MM LENS WITH FINE CROSSHAIR. HAS BUILT IN IR ILLUMINATOR FOR TOTAL DARKNESS. DESIGNED AND USED ON THE M-14 RIFLES BUT PICATINNY MOUNT ALLOWS MOUNTING ON VIRTUALLY ANY FIREARM. COMES WITH A HARD SHELL CARRY CASE. NEW IN THE BOX $2999.00 WITH FREE SHIPPING. CREDIT CARD SAME AS CASH.